Congratulations on the golden pumpkin award! Last edited by Lantern on Tue Oct 30, 2012 11:53 pm, edited 6 times in total. Now on to the voting! 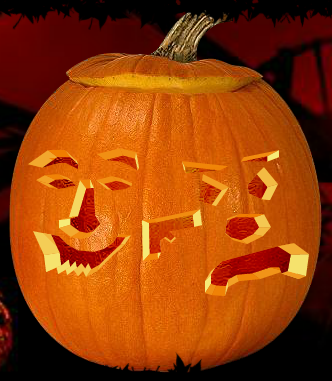 Here are your candidates for best virtual jack o'lantern carving. Please vote using the poll at the top of the page. 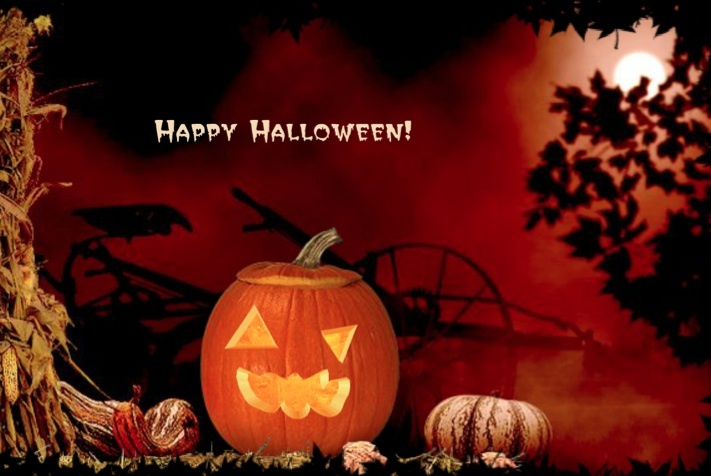 The award for best virtual jack'o lantern will be awarded on Halloween. An honorable mention for creativity goes to n00less cluebie for this creation. They can't vote for mine???? FIX!!! The "Sinatra Was Here" did it for me. I demand to be added to the survey! What does Frank Sinatra have to do with anything. Don't try to understand Lanty, just nod and move on. It will result in less headaches. Stop your cruelty to live pumpkins! Mine was only a dramatization, pickley friend. You are still safe with the Llama. It's a hardware shop selling safes and keys....Of course you want people to try the safes out. . . . I can accept being beaten by Schroberts. Lux dice ARE scary. But not n00less clubie. That's just Lludicrous. Too Cool! My Zuke-a-Lantern skills proved worthy! Thank you very much. Yes! It IS the combination to the safe and once again nudeless is correct, its on display for people to touch, use, feel. I am a locksmith so almost every year I carve home grown zucchinis into Lock themed pieces of rapidly decaying art. Good times! Get your election day practice in! Only a few days left. Don't forget there are bonus survivor points at stake! WHY can't i vote for Swirlie? Because he already won the "LIVE" carving contest. Nooooooo! 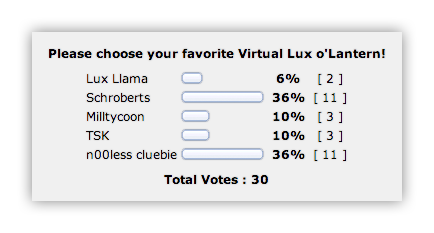 There are no ties in Lux O'Lantern. Or are there? The Silken Knot wrote: Nooooooo! There are no ties in Lux O'Lantern. Or are there? Yes,yes it appears there are ties in lux! 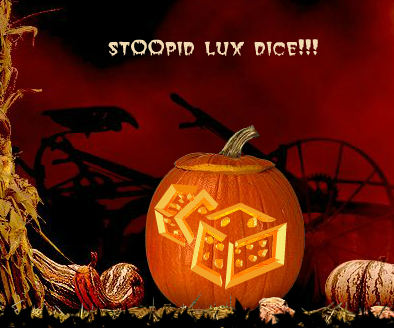 Congratulations to schroberts for her lux dice jack o'lantern! You have both won a golden lantern and survivor points! Congratulations. Originality won out. Enjoy your shiny golden pumpkins.